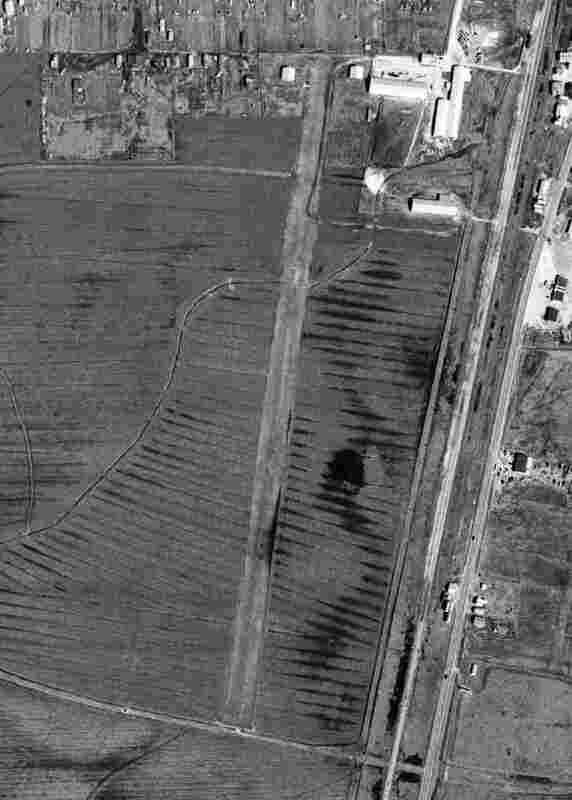 A 4/6/52 USGS aerial photo (courtesy of Dallam Oliver-Lee) depicted Hancock County Airport as having a single northwest/southeast unpaved runway. as it was not yet depicted on the 1949 Mobile Sectional Chart (courtesy of John Voss). 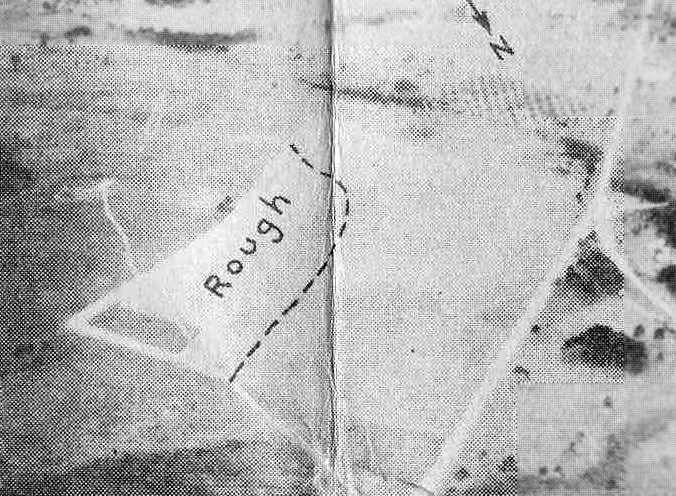 The earliest photo which has been located of this airfield was a 4/6/52 USGS aerial photo (courtesy of Dallam Oliver-Lee). 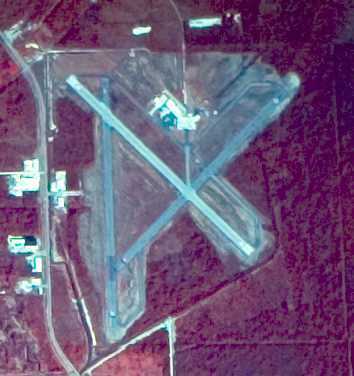 It depicted Hancock County Airport as having a single northwest/southeast unpaved runway. 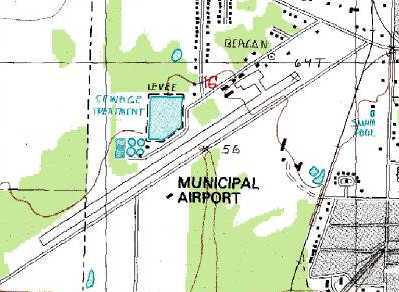 Hancock County Airport, as depicted on the 1957 USGS topo map (courtesy of Dallam Oliver-Lee). 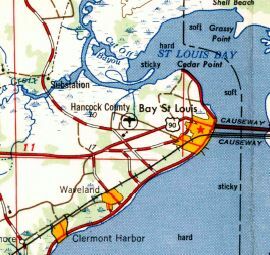 Hancock County Airport was still labeled on the 1963 USGS topo map (courtesy of Dallam Oliver-Lee). 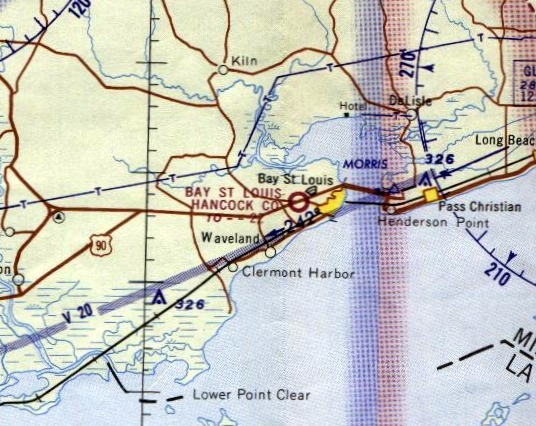 The earliest aeronautical chart depiction which has been located of Hancock County Airport was on the 1964 Mobile Sectional Chart. It depicted Hancock County as having a 2,200' unpaved runway. along with possibly one light aircraft. 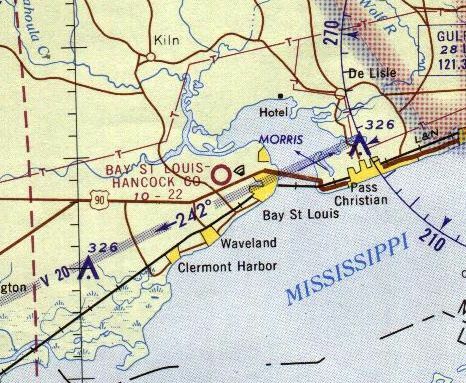 The last aeronautical chart depiction which has been located of Hancock County Airport was on the 1965 New Orleans Sectional Chart. as it was no longer depicted on the January 1971 New Orleans Sectional Chart (courtesy of Ron Plante). probably indicating the closure of the airport. 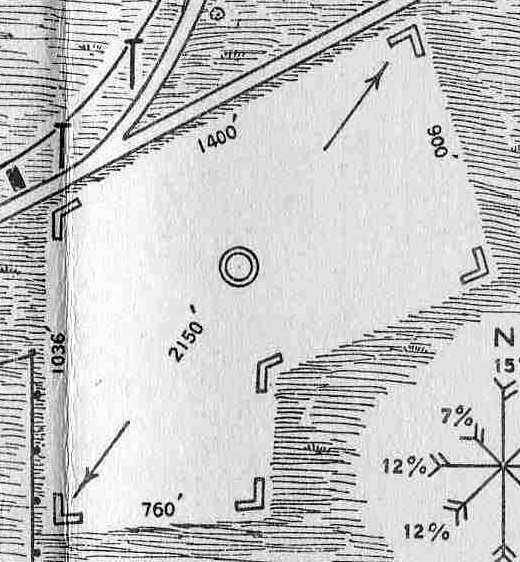 still depicted a single unpaved northwest/southeast runway, labeled simply as “Airfield”. 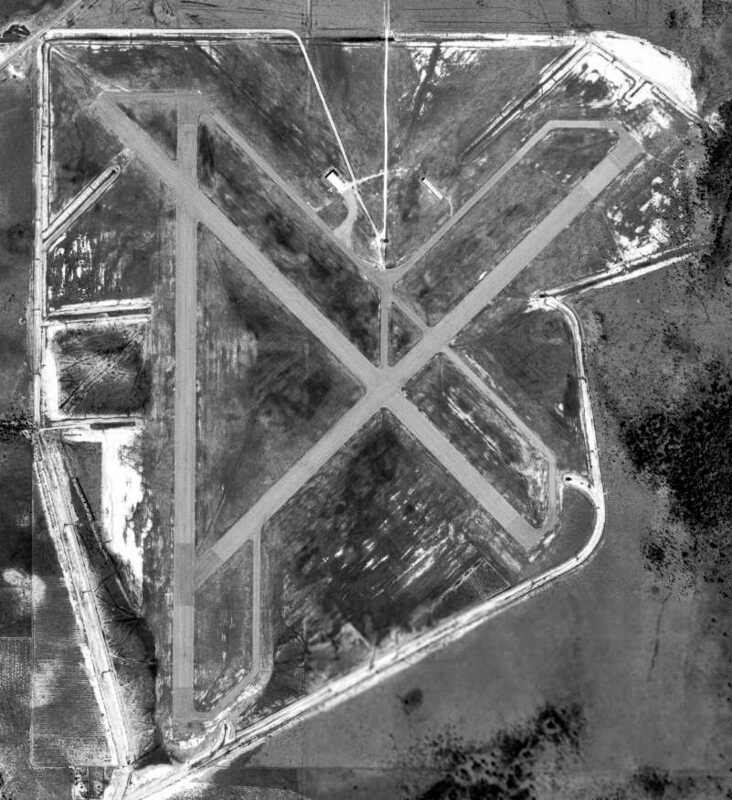 A 10/29/12 aerial photo (courtesy of Dallam Oliver-Lee) showed that the runway outline of the former Hancock County Airport remains recognizable. The site of Hancock County Airport is located southeast of the intersection of Washington Street & Chapman Road. 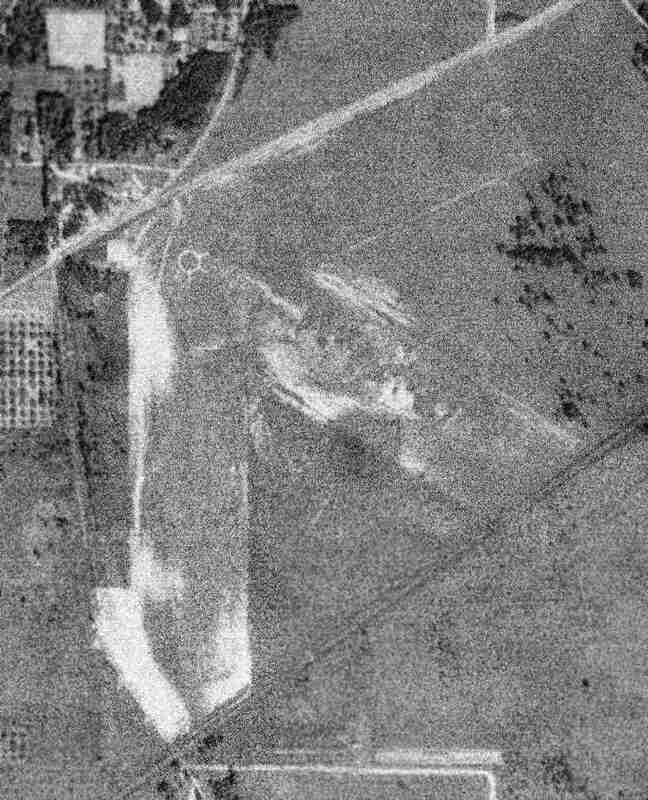 A 5/12/52 USGS aerial photo (courtesy of Dallam Oliver-Lee) depicted the first location of Picayune Airport as having 2 unpaved runways. 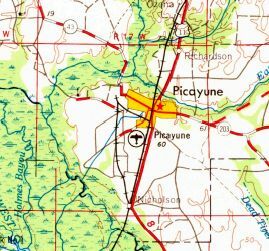 The first airport for the town of Picayune was located on the south side of the town. 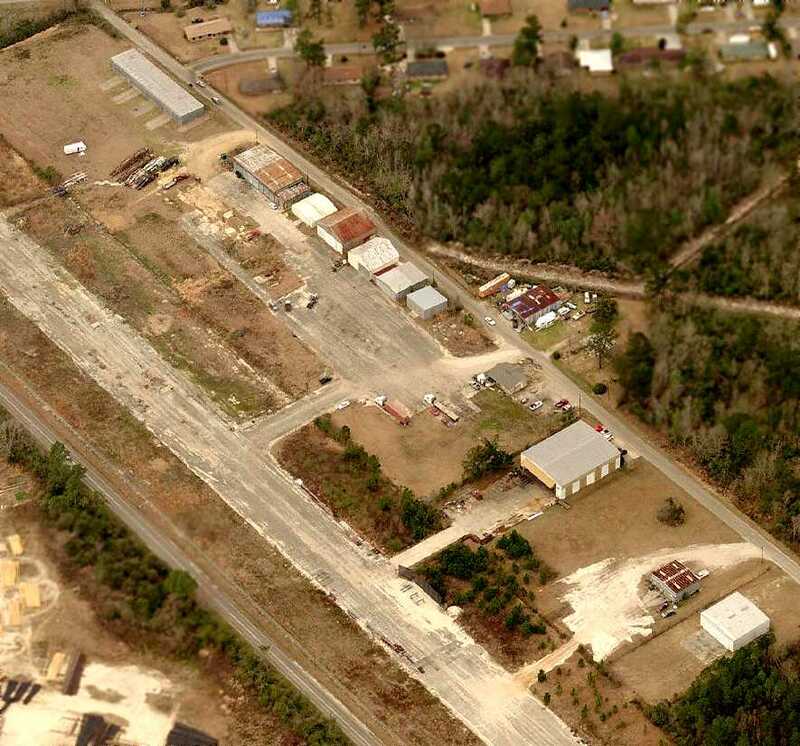 The date of construction of Picayune Airport has not been determined. 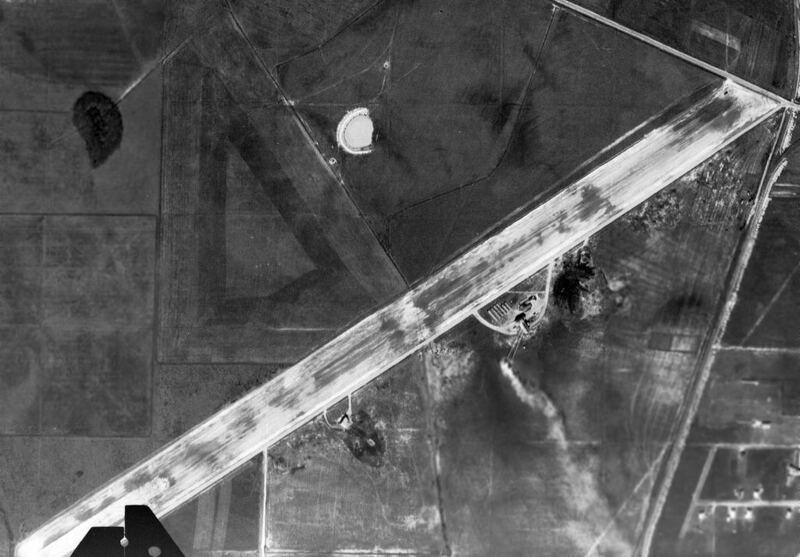 The earliest photo which has been located of this airfield was a 5/12/52 USGS aerial photo (courtesy of Dallam Oliver-Lee). 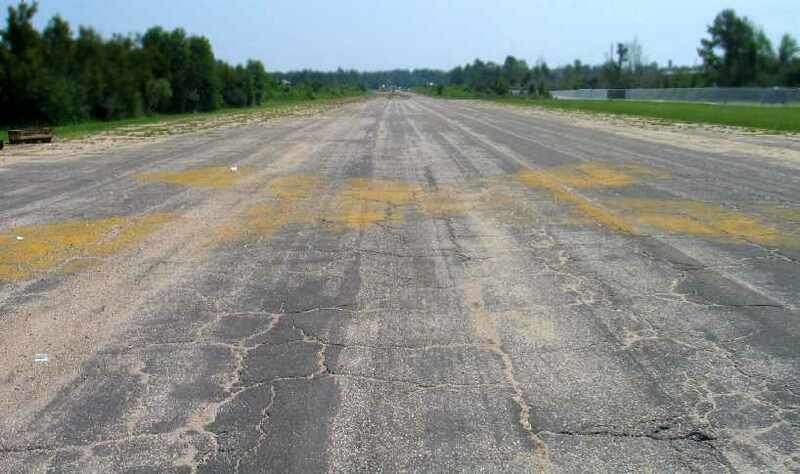 It depicted Picayune Airport as having 2 unpaved runways. 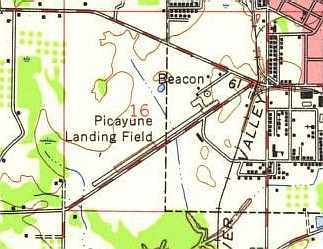 The earliest labeled depiction which has been located of Picayune Airport was on the 1953 USGS topo map (courtesy of Dallam Oliver-Lee). which showed one single-engine aircraft parked on the north end of a single unpaved north/south runway. Some small hangars were located on the north side. as that is how it was labeled on the 1957 USGS topo map (courtesy of Dallam Oliver-Lee). as the 1958 USGS topo map (courtesy of Dallam Oliver-Lee) only depicted the field on the west side. 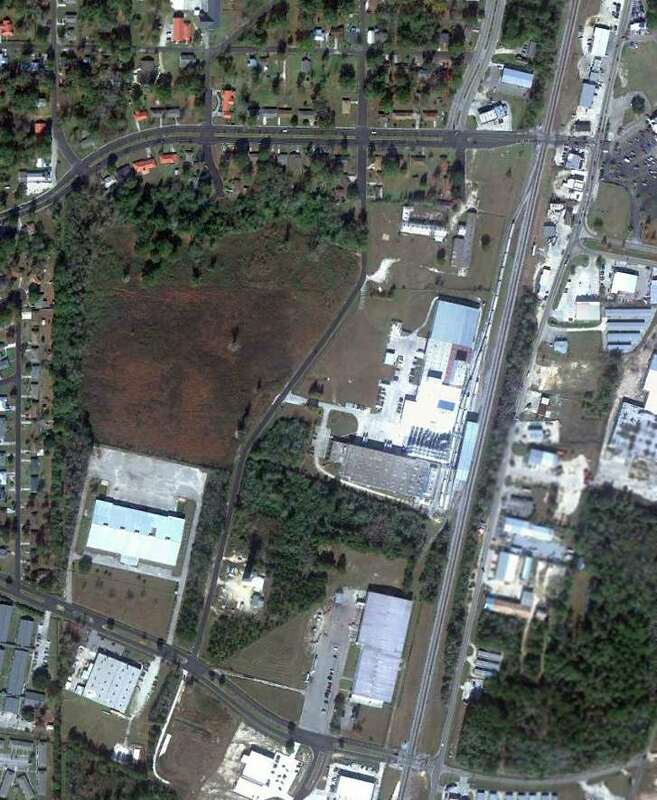 An 11/30/11 aerial view appears to show that at least one hangar from the original Picayune Airport remains intact. 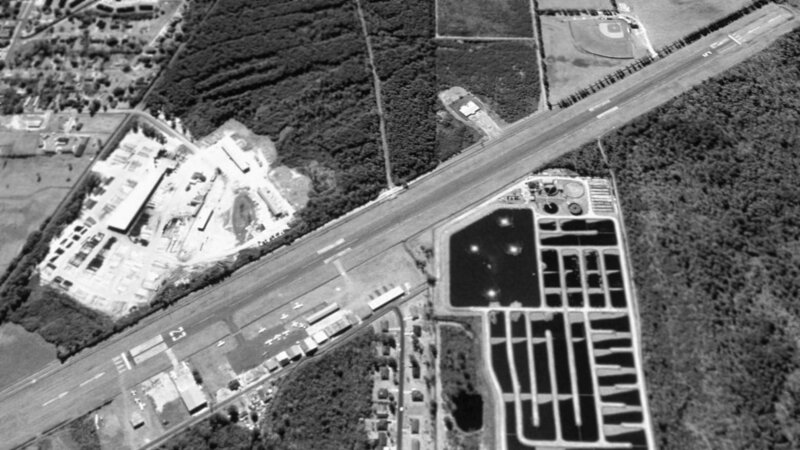 A circa 2011 aerial view looking east at a remaining hangar from the original Picayune Airport. The site of the original Picayune Municipal Airport is located south of the intersection of Bruce Street & Hunt Street. as well as a possible predecessor set of 3 unpaved runways. 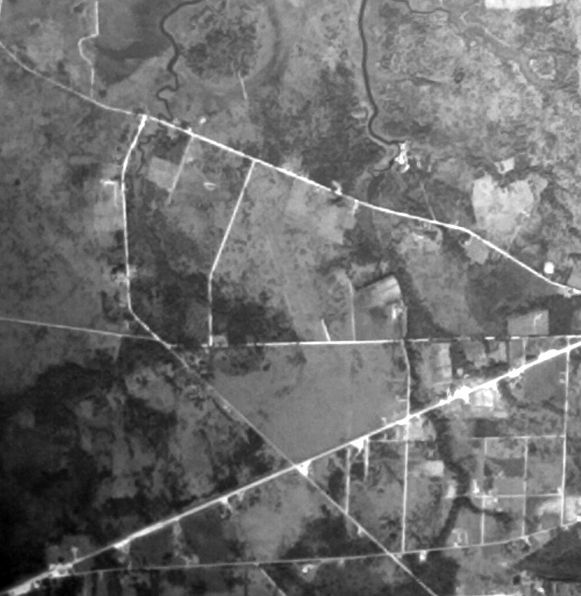 nor on a 5/12/52 USGS aerial photo (courtesy of Dallam Oliver-Lee). 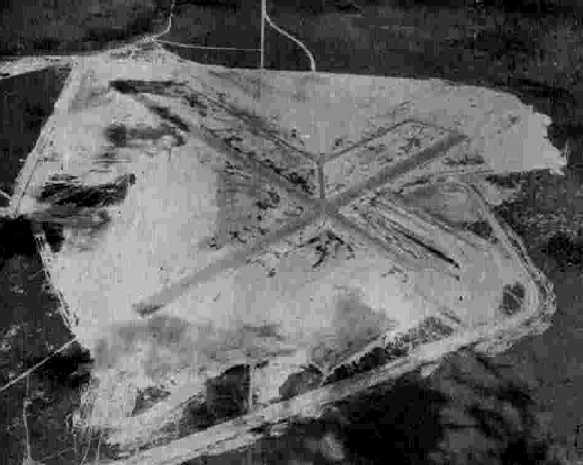 The earliest photo which has been located of this airfield was a 2/24/54 USGS aerial photo (courtesy of Dallam Oliver-Lee). 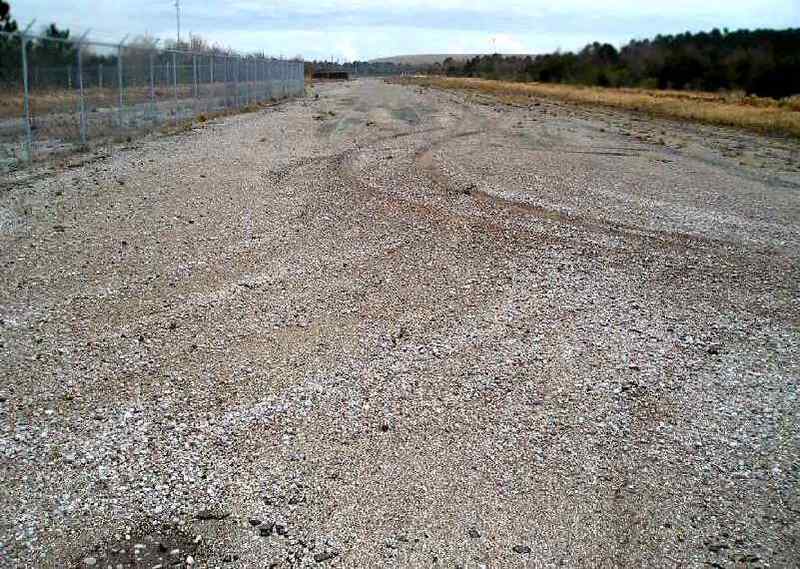 as well as a possible predecessor set of 3 unpaved runways located adjacent to the northwest side of the new paved runway. 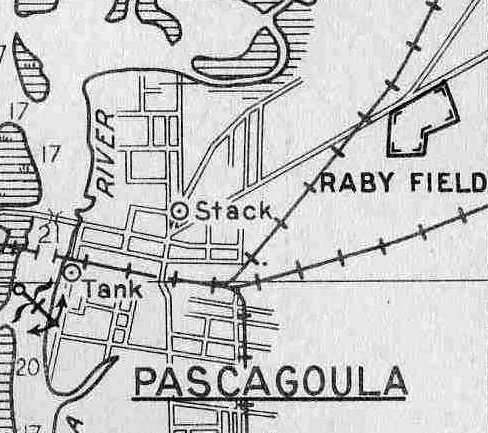 The Picayune Municipal Airport at this location was still not depicted on the 1957 USGS topo map (courtesy of Dallam Oliver-Lee). with a ramp & a beacon at the northeast corner of the field. along with a taxiway leading to a ramp on the northwest side of the runway with two buildings (hangars?). as having a single 4,000' concrete Runway 4/22. 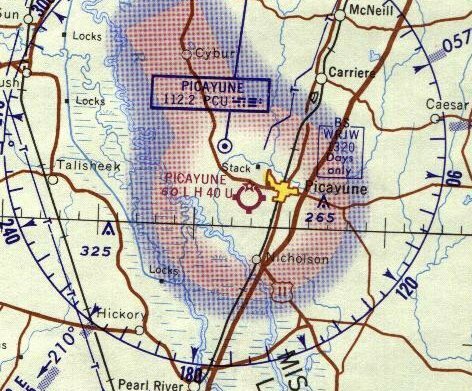 The earliest aeronautical chart depiction which has been located of the 2nd location of Picayune Municipal Airport was on the 1964 Mobile Sectional Chart. 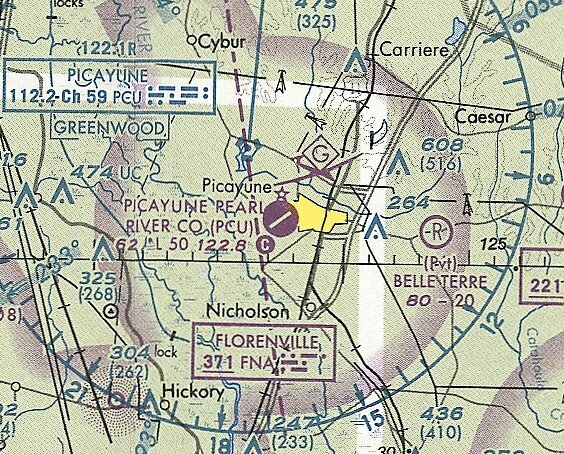 It depicted Picayune as having a 4,000' paved runway. and listed the operator as Ray's Flight Service. 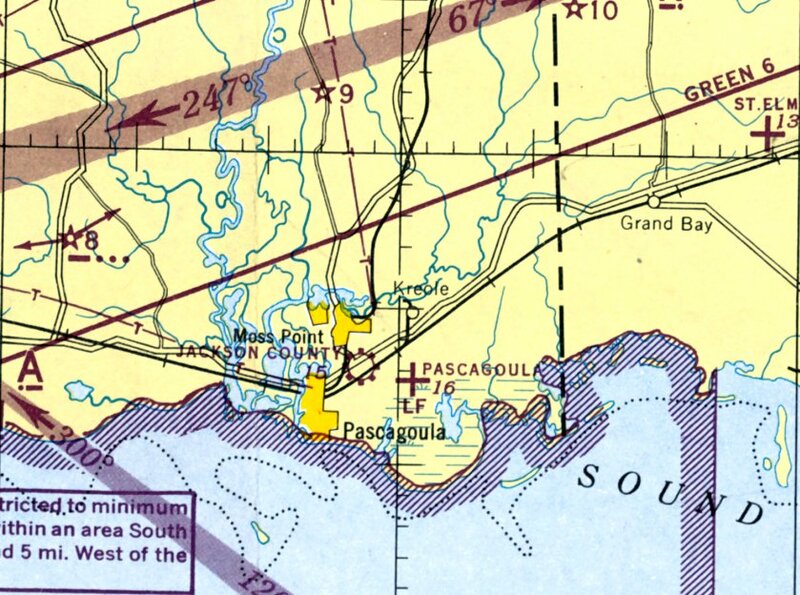 The 1985 USGS topo map depicted Picayune Municipal Airport as having a single northeast/southwest runway. 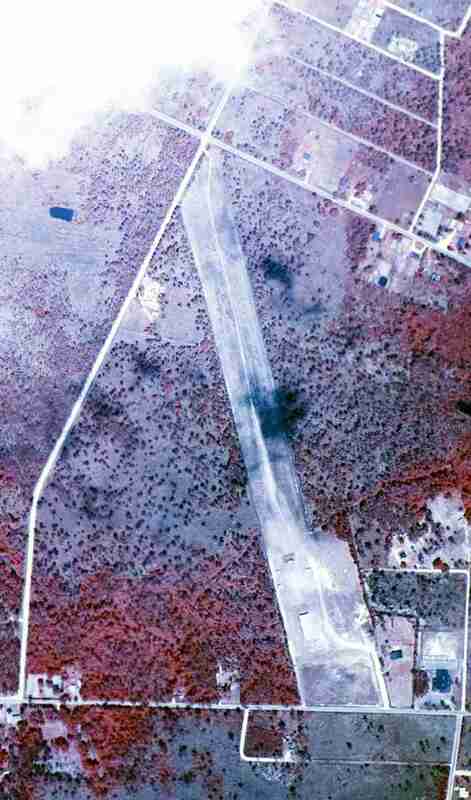 As depicted in a 1996 USGS aerial view looking south, Picayune Municipal consisted of a single paved 4,200' Runway 5/23. and another small hangar was on the south side of the runway. 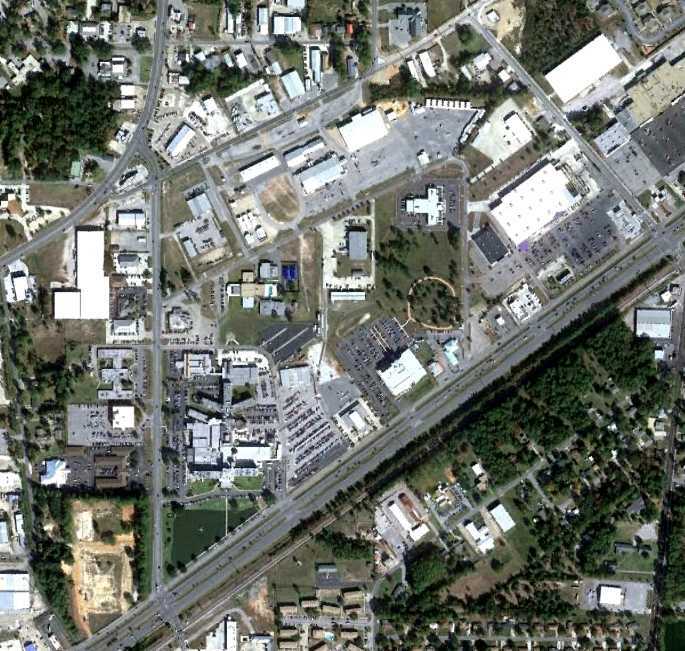 It depicted Picayune as having a single 4,000' paved northeast/southwest runway. and the original airfield was presumably closed at the same time. 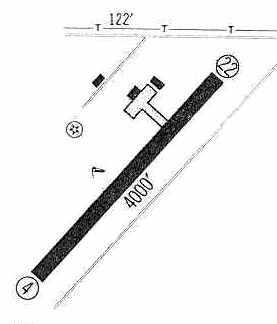 The original airport was depicted as an abandoned airfield on the 2003 Sectional Chart. David Sims reported in 2005, “The property is & has always been owned by the Picayune school district. After it was closed, the airstrip was used by a company to store large metal structures. 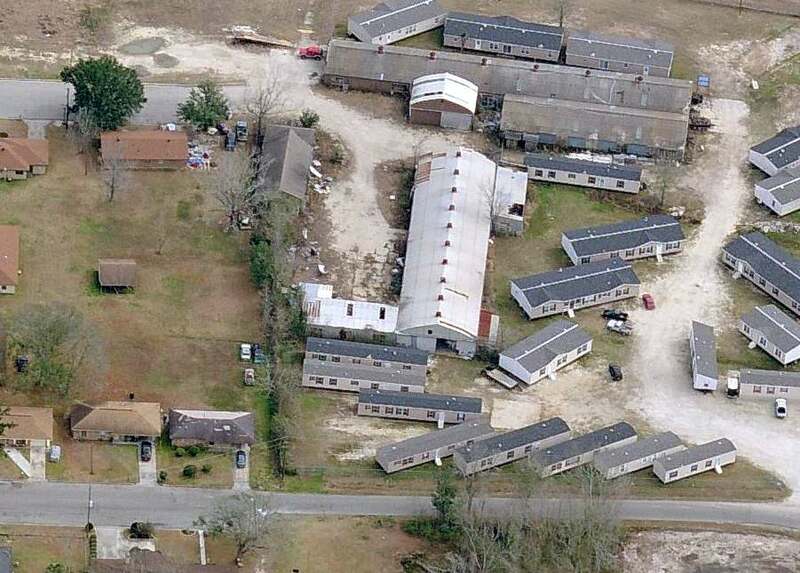 It is currently being used by FEMA for victims of Hurricane Katrina. 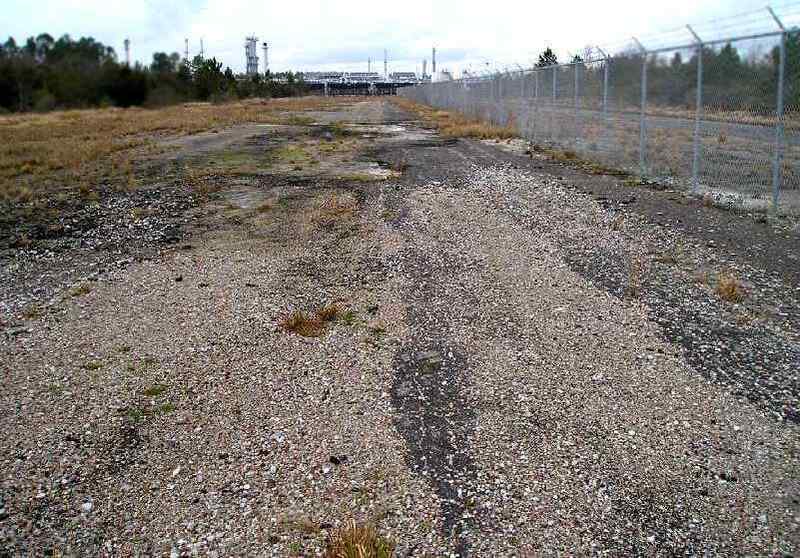 A 2006 photo by Ron Jackson, looking northeast along the abandoned former Runway 5 at Picayune. 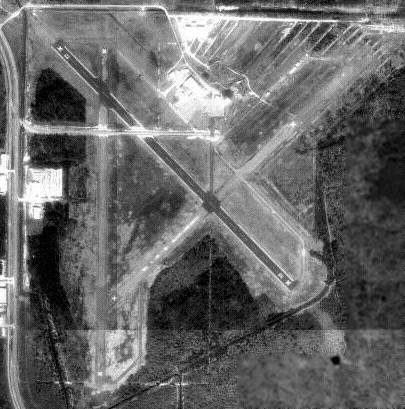 Note the closed-runway yellow “X” symbol still visible on the pavement. 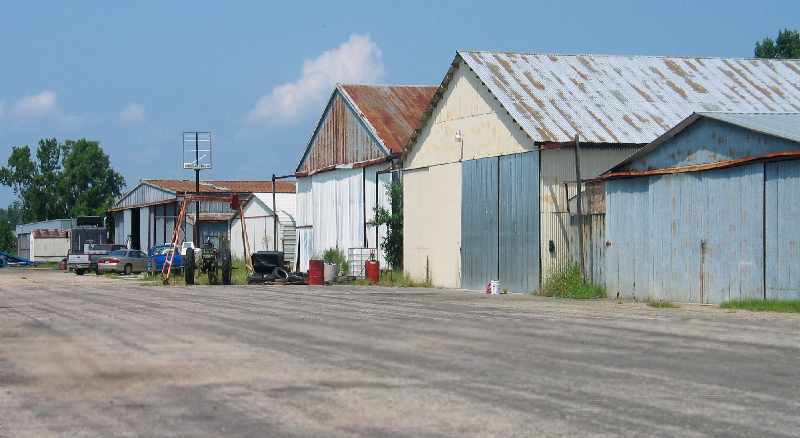 A 2006 photo by Ron Jackson, looking west at the former hangars on the north side of the field at Picayune. 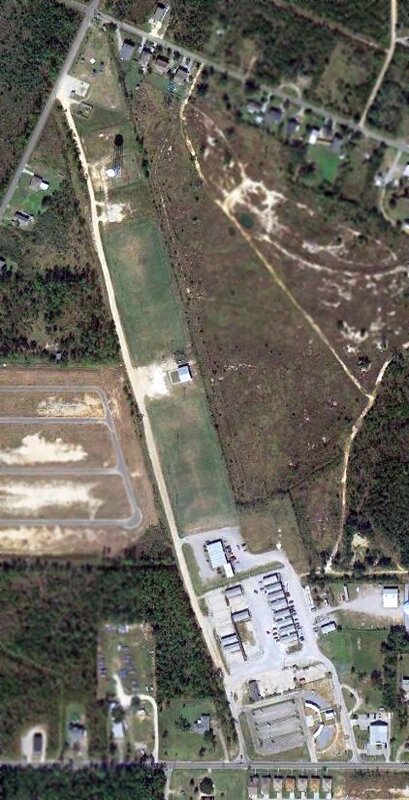 A circa 2006 aerial view looking west along the row of hangars & former runway of the 2nd location of Piccayune Municipal Airport. A 2017 aerial view looking southwest shows the hangars & runway of the 2nd location of Picayune Municipal Airport to remain intact. 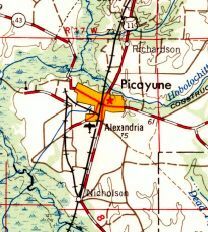 The site of the 2nd location of Picayune Municipal Airport is located southwest of the intersection of Palestine Road & Airport Road. Raby Field, as depicted on the 1934 Navy Aviation Chart V-242 (courtesy of Chris Kennedy). 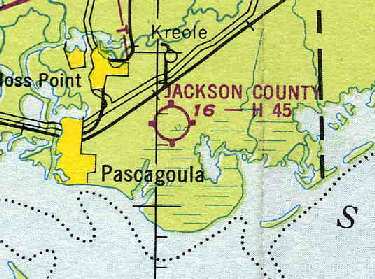 Pascagoula's first airport was located adjacent to the northeast side of the town. The date of construction of the field is unknown. which depicted it under the airfield's original name, Raby Field. 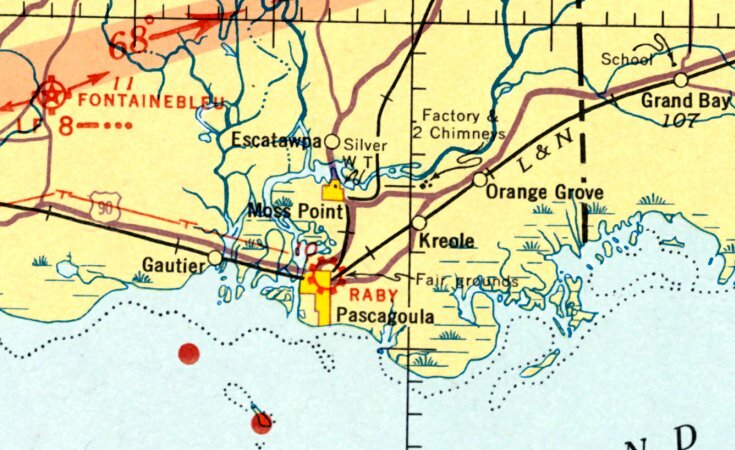 The location of Raby Field, from the 1934 Navy Aviation Chart V-242 (courtesy of Chris Kennedy). The layout of Raby Field, from the 1934 Navy Aviation Chart V-242 (courtesy of Chris Kennedy). It described Raby Field as consisting of a irregularly shaped sod landing area, with the longest distance measuring 2,150'. The field had no hangars or other facilities. An aerial view looking southwest at Raby Field, from the 1934 Navy Aviation Chart V-242 (courtesy of Chris Kennedy). 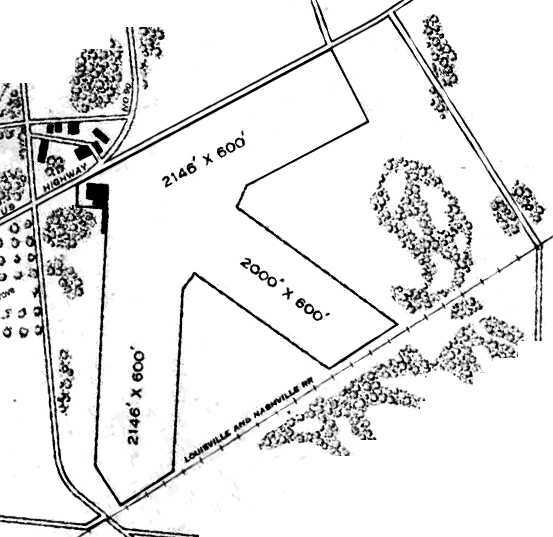 The August 1935 Mobile Sectional Chart depicted Raby Field as a commercial/municipal airport. and said that the field had a total of four 2,000' runways. with an airport circle marking at the intersection. 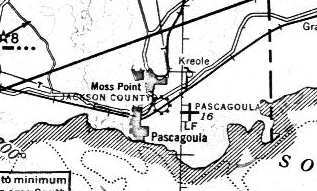 and a new Pascagoula Airport had been built a mile to the east, as depicted on the July 1945 Mobile Sectional Chart. as a 81 acre irregularly-shaped property containing 3 sod runways, the longest being the 2,146' north/south & east/west strips. The field was said to have 2 hangars, the largest being a 100' x 80' brick & steel structure. Jackson County Airport was described as being owned by Jackson County, and operated by private interests. 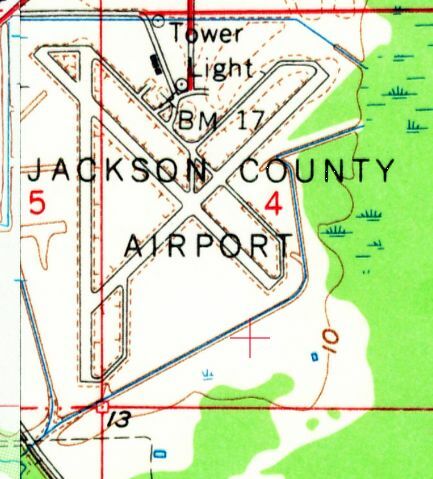 as only the new Jackson County Airport was depicted on the August 1946 Mobile Sectional Chart. but the outlines of the runways were still visible. The runway outlines were still recognizable on a 2/13/55 aerial view (courtesy of Dallam Oliver-Lee). showed the site to have been redeveloped, with no recognizable remnants of the airfield appearing to remain. A November 2011 aerial photo (courtesy of Oliver Dallam-Lee) showed no recognizable remnants of the original Jackson County Airport. 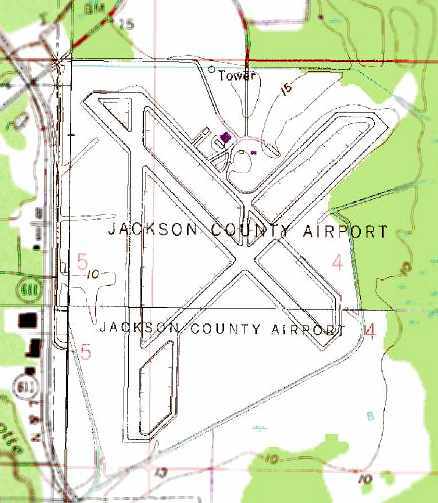 The original location of the Jackson County Airport is north of the the intersection of Route 90 & Vega Street. 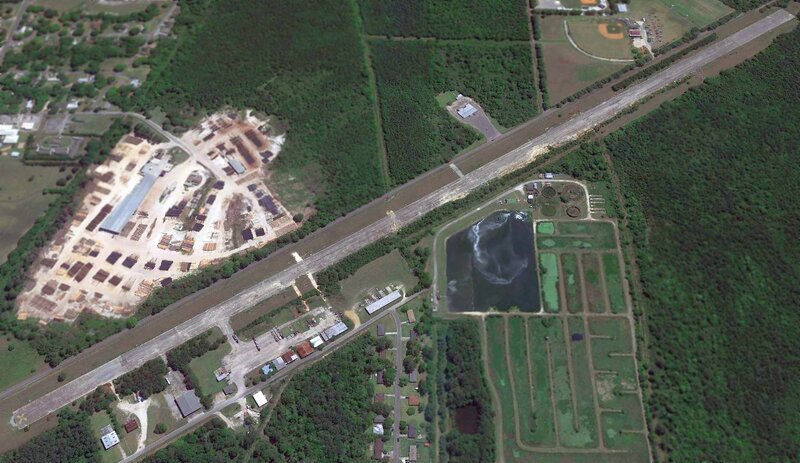 depicted Pascagoula Municipal Airport as having 2 paved runways. as it was not depicted on the 1941 Mobile Sectional Chart (courtesy of Chris Kennedy) nor on the 1943 USGS topo map. was a 4/27/43 aerial view from the 1945 AAF Airfield Directory (courtesy of Scott Murdock). It depicted the field as having 2 perpendicular paved runways with parallel taxiways. was on the 1945 Mobile Sectional Chart (courtesy of John Voss). 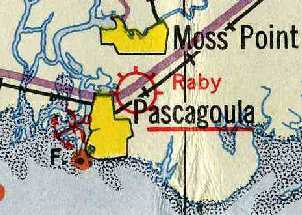 It depicted "Pascagoula" as an auxiliary airfield. as a 660 acre square property containing 3 asphalt 4,500' runways, oriented north/south, northeast/southwest, and northwest/southeast. 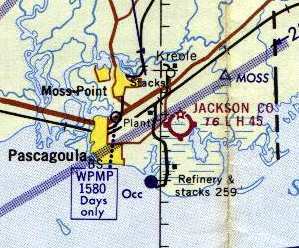 Pascagoula Municipal Airport was described as being owned by Jackson County, and operated by private interests. as that is how it was depicted on the 1949 Mobile Sectional Chart (courtesy of Chris Kennedy). A 4/7/52 aerial view (courtesy of Dallam Oliver-Lee) depicted Pascagoula Airport as having 3 paved runways & taxiways. 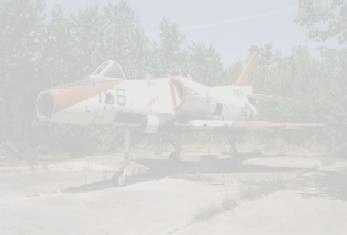 Two small hangars were on the north side of the field, near which was visible one single-engine aircraft. 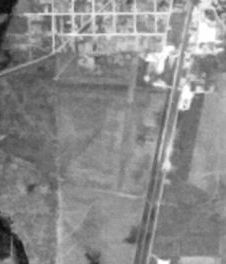 A 2/13/55 aerial view (courtesy of Dallam Oliver-Lee) showed that a 3rd small hangar had been added at some point between 1952-55.
and 1 building on the north side of the field. along with several buildings (hangars?) along the north side of the field. as having three 4,500' bituminous runways: 18/36, 14/32, and 5/23. The operator was listed as Robert Neal. using Martin 404s, ending in the 1960s. I have several items from Southern, including a route map, showing service there. Southern, typical of that era, showed on the route maps little diagrams of the runway configurations of served airports. as depicted on the 1964 Mobile Sectional Chart (courtesy of John Voss). was a November 1979 USGS fakse-color aerial view (courtesy of Dallam Oliver-Lee). which was significantly less than the number of buildings depicted on the 1960 diagram. 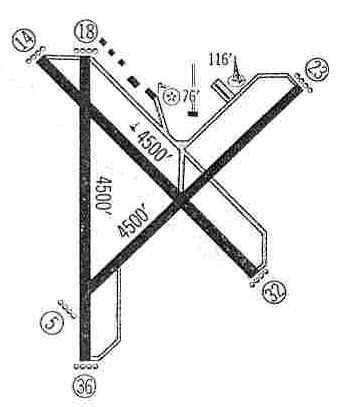 In the 1982 AOPA Airport Directory (courtesy of Ed Drury), the runway configuration was still the same. The operators was listed as General Aviation Corp., Gulf Coast Aircraft Sales, and Everon Air. by the brand-new "Trent Lott International Airport" just north of the city. Jackson County Airport was presumably closed upon completion of the new airport. with all 3 runways still largely intact, and several hangars still standing north of the ramp. 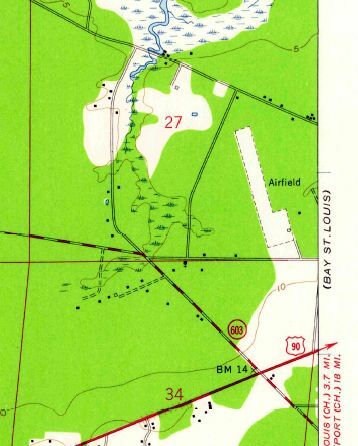 The 1998 World Aeronautical Chart depicted the site of Jackson County Airport as an abandoned airfield. At some point after the airport's abandonment, the property was redesignated as the Bayou Casotte Industrial Park. 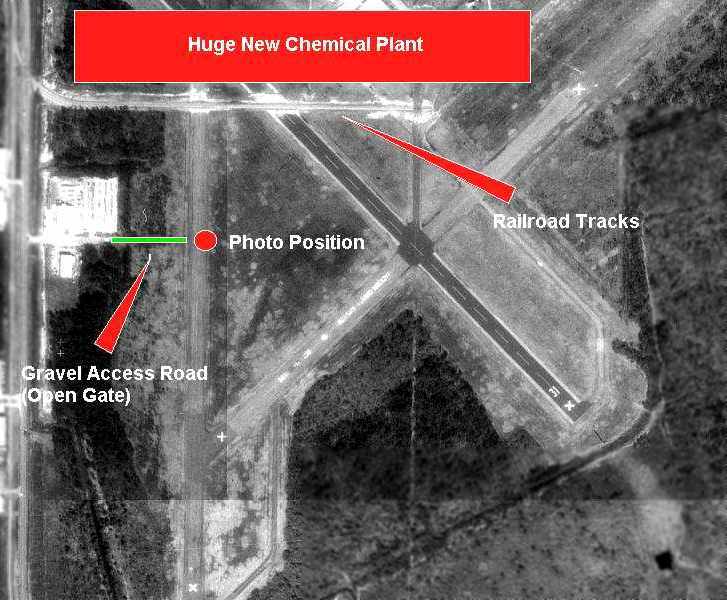 with a large chemical plant having been constructed over the former terminal area on the north side of the field. Bret Kepner visited the site of the Pacagoula Airport in February 2005.
above the train tracks which were built across the oldest runway. As can be seen. the surface is really, really bad. A February 2005 photo by Bret Kepner looking north along former Runway 18/36, toward the new chemical plant. A February 2005 photo by Bret Kepner looking south along former Runway 18/36, toward its intersection with former Runway 5/23. 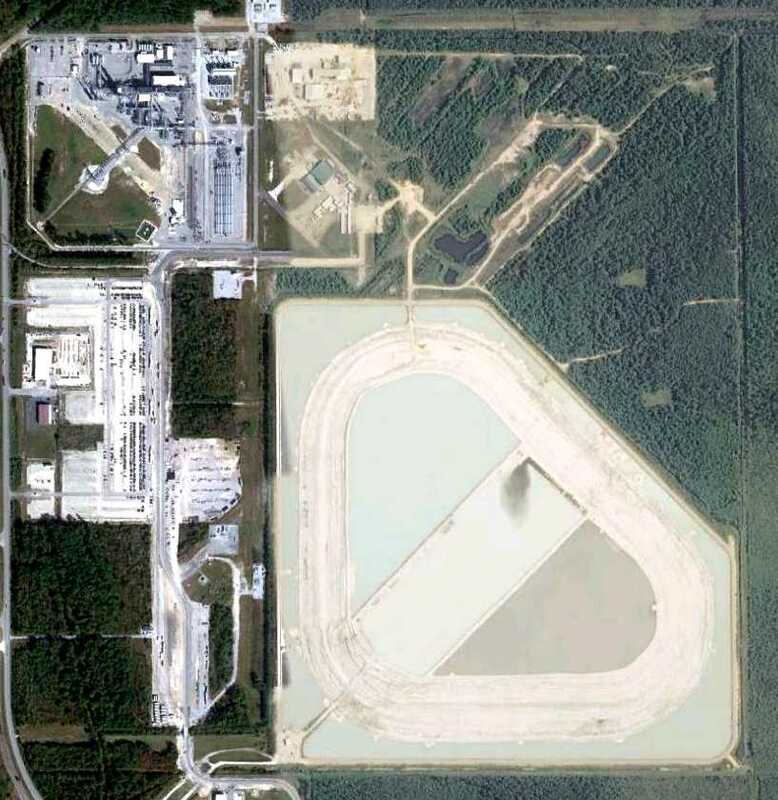 An 11/11/11 aerial photo showed that the majority of the former airport property has been covered by a surface-mining quarry, filled with water. Portions of several runways still remain intact on the west & north sides.